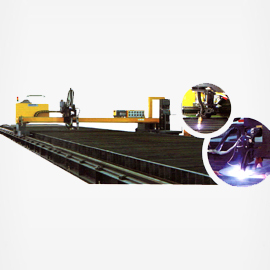 The ArtHydef Plasma Bevel cutting system is widely applicable in ship-building, structural steel and mechanical device manufacturing industries. The ability to cut parts with accuracy and precision in 2-D, but with the added benefit of 3-D cutting to prepare edge surfaces that are correctly beveled and clean to be immediately ready for subsequent welding operations, without the need for additional weld-prep operations. This benefit delivers substantial improvements in productivity and cost savings! The design of the rotating head does not twist the cables, and reliability is improved by eliminating the need for a rotary contactor ring to transmit electrical signals. This system supports a smooth continuous change to the bevel angle while cutting to realize plate curve bevel cutting, and can also cut V, X, K or Y bevels. Typical applications include cutting ship hull components, or pressure vessels with domed surfaces where beveled sections are cut from the rounded surfaces. The plasma bevel Cutting Machine has the capability to perform scarf function to remove weld beads and leave a seamless appearance to welded seams, eliminating the need for subsequent machining processes. The plasma system is matched to meet the cutting requirements of the customer and application.